For a special experience that is a blast for both kids and adults, consider a trip to the Rowdy Bear Mountain Adventure Park. Its two award-winning rides combine the thrill of an amusement park with the natural beauty of the Smoky Mountains. 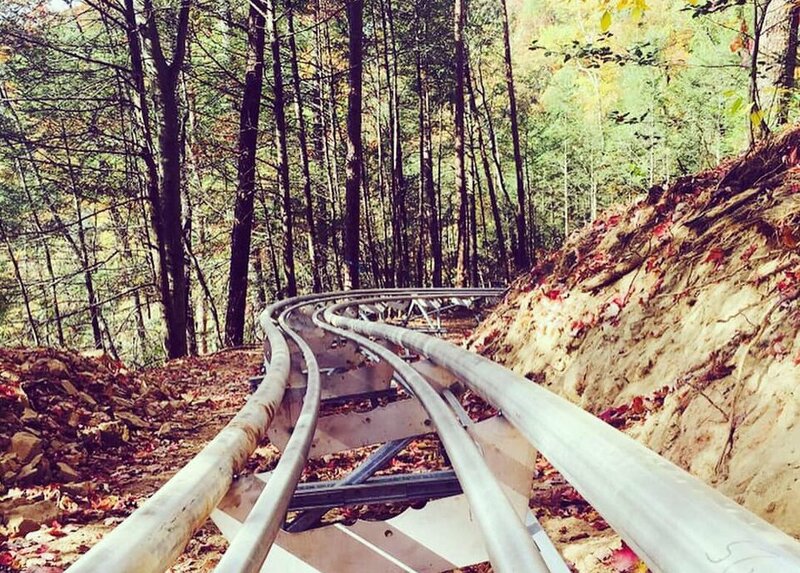 Rowdy Bear has the newest mountain coaster in the Gatlinburg, Tennessee, area. Kids as young as three love riding the gravity-powered roller coaster that winds through gorgeous trees by day and colored lights at night. There’s a second ride too, the Mountain Glider, which feels like a combination of hang gliding and free falling. Staff members here get high marks for being helpful and nice. Propelled by gravity, the Rowdy Bear coaster can reach speeds up to 35 mph. How fast you go is up to you. Each coaster comes with a brake that you control. Some people who go on multiple rides start off slow, then go a little faster on their next ride, and then build up the courage to go at top speed. Being able to slow the coaster down makes this ride ideal for young children. Kids as young as three can ride, as long as they are at least 38″ tall. Kids from three to nine must ride with a coaster driver who is at least 16 years old. The ride is both thrilling and safe, thanks to an Intelligent Distance Control System. The coaster winds through the beautiful wooded Rowdy Bear mountainside, offering peaceful views during the day. At night, multi-colored lights surround the whole track, creating an experience that feels magical. You can buy a ticket for an individual ride, a combo ticket for the coaster and the glider, or a pass for unlimited coaster rides for an hour. The pass is the best deal. Some people have been able to ride 10 times in their hour but that will depend on how many people are in line when you go and how fast or slow the coasters are going. To get the most value from your hour pass, go to Rowdy Bear on off-peak hours. Have you ever wanted to fly through the treetops? The Mountain Glider may be the next best thing. It’s the first ride of its kind in the world. You glide through the trees suspended from a rail. Like the coaster, the glider is both exciting and safe. Kids must be at least 48″ tall to ride the glider. Rowdy Bear Mountain Adventure Park is open year round. Hours are 10:00 a.m. to 9:00 p.m. Sunday through Thursday and 10:00 a.m. to 10:00 p.m. Friday and Saturday. Hours may be extended during holiday weeks. You can check for updated holiday hours on their Facebook page. They’re located at 306 Parkway in downtown Gatlinburg. Make a reservation by calling (865) 409-5045 or by visiting the Rowdy Bear website.